In a large bowl, mix together the cake and pudding mixes, sour cream, oil, beaten eggs and water. Stir in the chocolate chips and pour batter into the greased or lined muffin tins. Fill them up 3/4 full. Turn the oven down to 325 degrees F. Bake for 18 to 23 minutes or until the top is springy to the touch and a wooden toothpick inserted comes out clean. Cool cupcakes thoroughly in the pan at least a few minutes before transferring onto a cooling rack. Cool completely. Yield: 24 cupcakes plus one extra. Note: I cut the mousse recipe in half and had more than enough! Whisk sugar, yolks and water in a large metal bowl. Set bowl over saucepan of simmering water (do not allow bowl to touch water); whisk until candy thermometer registers 160 degrees F, about 8 minutes. Meanwhile, pour the chocolate chips into another bowl and set aside. Remove egg mixture bowl from over water. Pour it over the chocolate chips. Let it sit for a minute or two, then stir. Using an electric mixer, beat egg/chocolate mixture until cool and thick about 5 minutes. Beat cream in another large bowl until stiff peaks form. Fold the cream into the chocolate egg mixture. For the chocolate drizzle I used Hershey's Hot Fudge. For the frosting I just used store bought Duncan Hines Buttercream. It was getting really late so I cheated. You can view the recipe for the Swiss Meringue Buttercream Icing that Kim used here. Once the cupcakes are cool, core out the center of each one. I used my Pampered Chef small cookie scoop. Using a pastry bag, pipe chocolate mousse until the center is almost full and then top with a drizzle of hot fudge. Once all the cupcakes are filled, pipe frosting onto each one using a pastry bag fitted with the large star tip. Lastly, drizzle chocolate on top of each cupcake . I downloaded the starbucks logo from the website and printed it off onto paper. These are amazingly delicious and I'm sure if you made the frosting yourself you would just die right on the spot from pure delight! Linking up with some of THESE parties! Check them out! 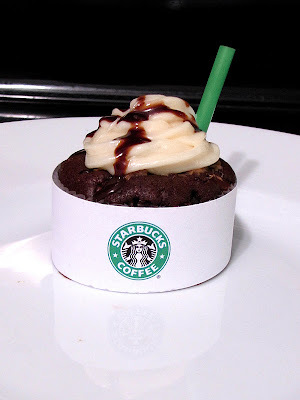 These look delicious and I love the extra touch of adding the Starbucks logo --- adorable! Such an awesome and delicious idea! I think I will try them! Thanks for sharing! 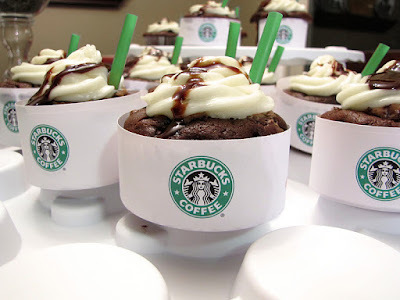 These are so cute and look absolutely delicious! Mmmm these look amazing! And cute in those cups. Just pinned to my recipes's board-thanks for sharing! Wow one of the best cupcake ideas I have ever seen! They look so yummy! I love it how you wrapped Starbucks logo! I love everything about these! Pinning this recipe for future use. Saw these over at Someday Crafts! This looks delicious!!! Following you back.